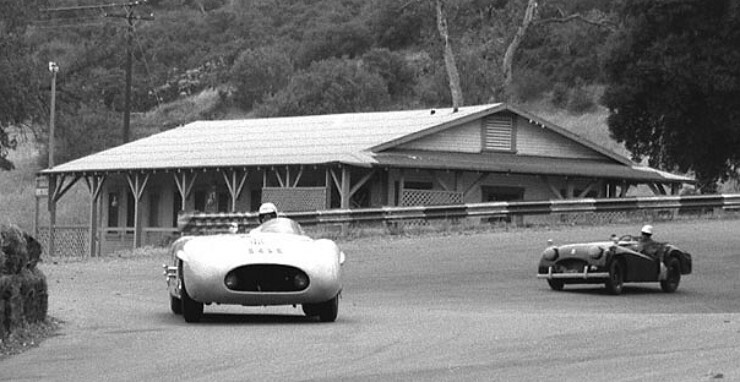 Bob Norton sent me these two photos of one of my favorite cars, Chuck Porter's Mercedes Special. 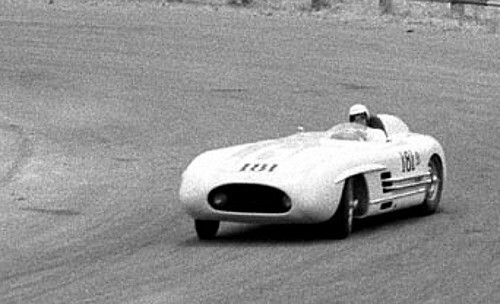 The car eventually was powered by a full-race Corvette V8. The class "B" marking shows that its displacement here was at least 5001 cc. This was during the brief period when the car was Buick- powered. Porter found the car's original 3-liter 6 cyl. 300-SL engine heavy and down on power for modified class racing. He tried supercharging, but that wasn't enough. Then came the Buick, and after that various hot-rodded Corvette V8s. Here'a front-on view of the beast. Porter has just devoured a badly overmatched and thoroughly intimidated Triumph TR-2. The highly banked corner still exists at Paramount Ranch, the building does not. Marco Kaffenberger, nephew of Dr. Klaus Lehr, created this new website dedicated to this interesting car.